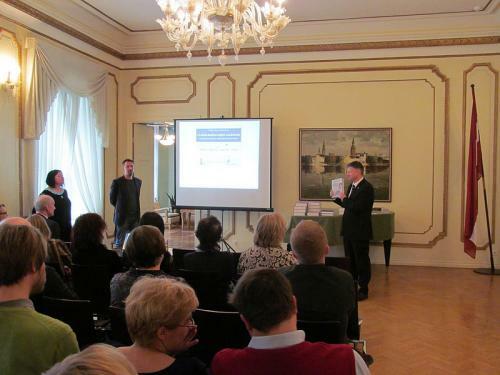 On April 18, 2013, in the Embassy of the Republic of Latvia in Tallinn the Ambassador Kārlis Eihenbaums arranged the opening of the electronic version of the „Livonian-Estonian-Latvian Dictionary” and the collection of articles „Livonians. History, Language and Culture”. The compiler of „Livonian-Estonian-Latvian Dictionary” is the professor emeritus at Tartu University Tiit-Rein Viitso and the editor is Dr.phil. Valts Ernštreits, researcher at the Tartu University. The participants of the event were introduced to the electronic version of the Dictionary which is accessible for everyone at http://www.murre.ut.ee/liivi/. Professor Tiit-Rein Viitso pointed out that this Dictionary has been compiled to be accessible to anyone who wants to study the Livonian language. For that reason, the supporters of this Dictionary – the Livonian Culture Centre, Tartu University and Latvian Language Agency – encourage everyone to use this dictionary as a source of learning the Livonian language, getting to know Livonian culture, traditions and lifestyle, thus destroying the boundaries which have been standing among the Livonian, Estonian and Latvian languages. The collection of articles „Livonians. History, Language and Culture” in Latvian was made by translating it from Estonian and editing it. The editor-in-chief of Latvian version Renāte Blumberga emphasised the significance of this collection, since the former scholarly collection about Livonians was published only in 1994. This collection of articles was supported by the Ministry of Culture of the Republic of Latvia and Latvian Language Agency. In the conclusion, the representative of the Ministry of Education and Science of the Republic of Estonia Jiri Valge, and the Ambassador of the Republic of Latvia Kārlis Eihenbaums highlighted, how successful the co-operation of those countries is, especially taking into account the upcoming Estonian-Latvian-Estonian dictionary. The representatives of both countries expressed their happiness about this co-operation project which has already started. This dictionary, with 40 000 headwords (each direction), is financed by the Estonian-Latvian programme and it can be considered as on of the priorities in the mutual relations of Estonia and Latvia – the progress of compiling the dictionary was discussed also during the recent meeting of both countries’ Foreign Affair Ministers.